Here is another 1:64 scale model diecast in China for Japan. 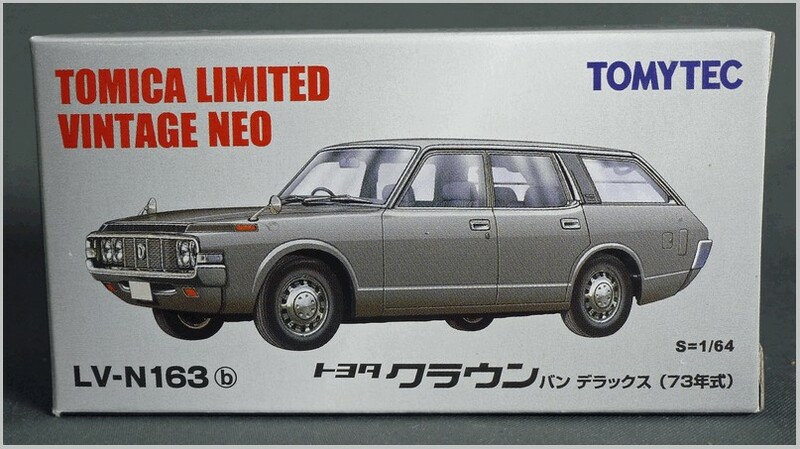 The Tomica Limited ranges are premium ranges generally to 1:64 scale, unlike the standard Tomica range which is a ‘fit the box’ range like Matchbox. 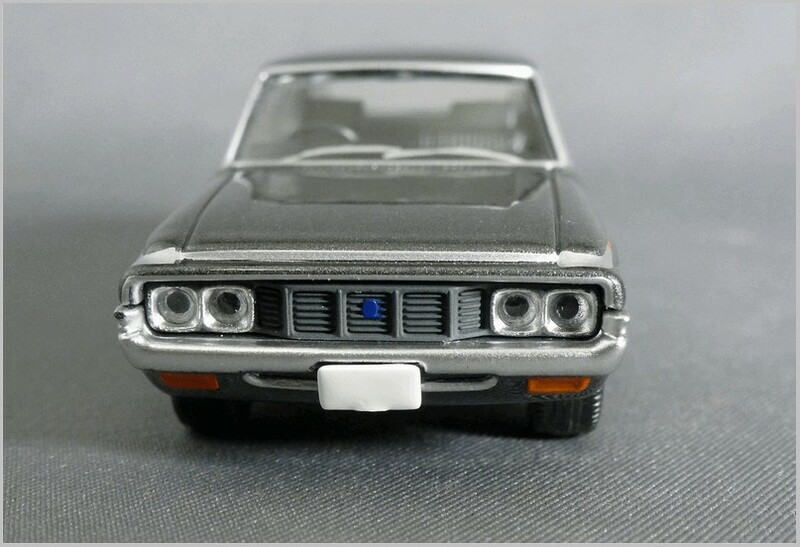 The Vintage ranges focus mainly upon classic Japanese vehicles of the past. 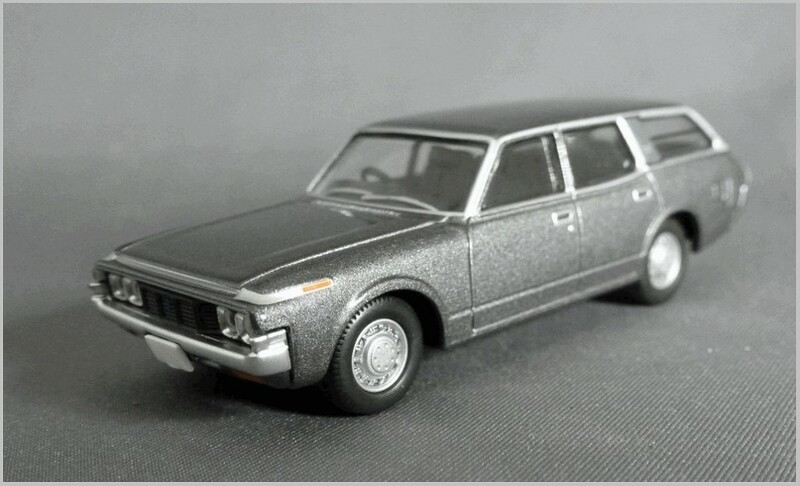 Here we have the Toyota Crown Estate, though I was interested to see that the Japanese call this style of vehicle a van. The Crown was a full size luxury model and the model shown here was the fourth generation of this vehicle sold between 1971 and 1974 generally fitted with a 2.6 litre engine but also available in smaller engines too. Outside Japan everyone had round headlights as shown on the box whilst in Japan they had squarer lights which were early halogen lights. The model is fitted with the squarer units. Unfortunately for Toyota the styling did not find favour in the US and so sales were restricted. I think that there were a limited number of these cars imported into the UK. 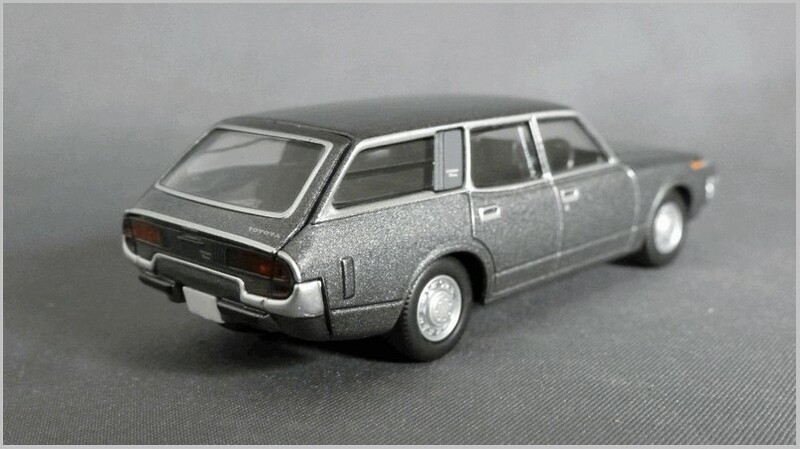 The Tomica model is excellent. The level of detail is above expectations for a 1:64 scale model putting many of its competitors to shame. Fabulous flush glazing allows the windows surrounds to be printed beautifully and convincingly. There is even a tiny script on the C pillar which reads Crown Deluxe as well as tiny scripts on the tailgate. The wheels are excellent mouldings reproducing the period hubcaps well and they are fitted with nice rubber tyres. Inside a black moulded tub represents the interior well, though there is an awkward lug in the rear luggage area presumably to fix the base plate in some way. The car was from a period when heavy use of chrome work was expected on Japanese cars and the printed chrome is very realised. All lights are plastic self coloured inserts except for the front indicators and the grille is another plastic insert and moulded in detail. All in all an excellent model and a model of a car from an era where few remain.